Shop till you drop at Fremantle Markets and Twilight Hawkers Market. Get a sense of the local culture at Fremantle Prison and Western Australian Maritime Museum. Change things up with these side-trips from Perth: Burns Beach (in Burns Beach), Swan Valley Cuddly Animal Farm (in Henley Brook), Rockingham (Penguin Island, Shoalwater Islands Marine Park, & more), Cohunu Koala Park (in Byford), Mullaloo Beach (in Mullaloo), Zanthorrea Nursery (in Maida Vale), Armadale Reptile Centre (in Armadale), Fremantle (Fremantle Fishing Boat Harbour & South Beach Recreation Reserve), Mandurah (Dolphin Quay, Mandurah Cruises, & more), Yanchep National Park (in Yanchep), Whiteman (Caversham Wildlife Park & Whiteman Park), Churchman Brook Dam (in Roleystone), Kalamunda Water Park (in Kalamunda), Wanneroo Botanic Gardens & Mini Golf (in Wanneroo) and Mundaring Weir (in Mundaring). Pack the 24th (Mon) with family-friendly diversions at Adventure World. Spend the 8th (Tue) exploring nature at John Forrest National Park. 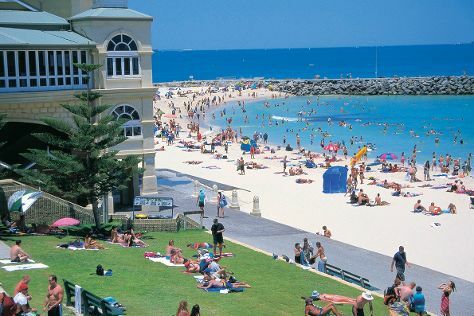 And it doesn't end there: kick back and relax at Cottesloe Beach, contemplate the long history of The Perth Mint, tour the pleasant surroundings at Scarborough Beach, and admire the natural beauty at Kings Park & Botanic Garden. For ratings, other places to visit, photos, and more tourist information, refer to the Perth itinerary builder. Use the Route module to find suitable travel options from your home destination to Perth. In December, daytime highs in Perth are 35°C, while nighttime lows are 18°C. Finish up your sightseeing early on the 14th (Mon) so you can travel back home.